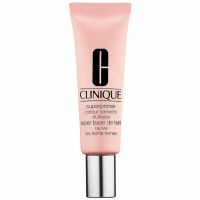 There are a lot of Clinique products I like, and I got a sample of this around the same time that I was in the market for a primer so I tried it out for a few days optimistically. Unfortunately, it just wasn't great. It goes on smoothly enough, but I thought the texture felt more like a moisturizer than a primer--more like it was sinking into my skin than prepping skin for foundation. I tried it w...read moreith my usual powder foundation and with a liquid foundation I was trying out and it just didn't impress me. Both products looked the same as if I put them on without primer at all. It may have helped my foundation last longer than without primer...but not much. Unfortunately this is not a product I will be buying in a full size. This color corrects to create a balanced base to work from. The texture is not to heavy, which is great.